If you aren’t afraid of calories, these 13 freak shakes are perfect for you! The recipe Graze created just for us? The delicious Mango and Coconut Sky High Shake. It’s really good and super Instagrammable. This over the top chocolate milkshake is topped with incredible Irish cream infused cream puffs, whipped cream, caramel, and sprinkles. an extremely delicious, fun and no-cook family movie night recipe that’s an instant hit with all age group. One strawberry, marshmallow and doughnut freak shake. Vegetables in a freak shake? Oh yes! In this healthier mega milkshake, made with fruit and vegetables, the beetroot gives it a wonderful purple color. You’ll never look at a milkshake the same again. 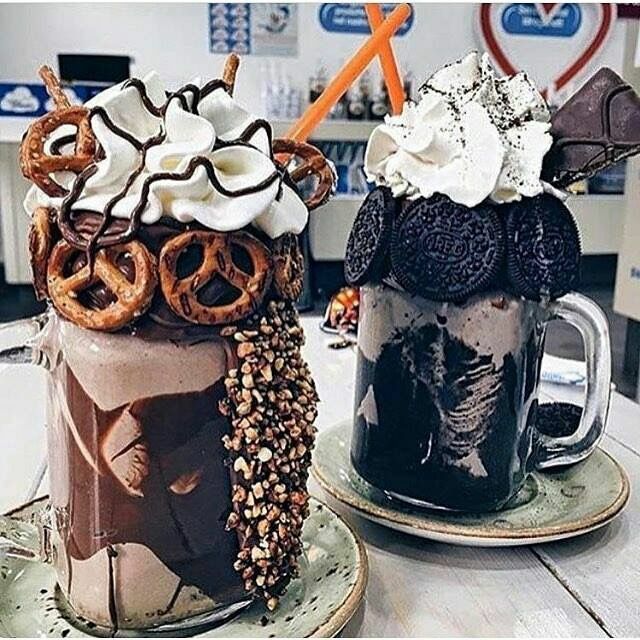 Patissez in Canberra, Australia has given the internet a sugar rush with Freakshow Shakes, milkshakes of outstanding proportions (and portions). Chocolate pretzel and chocolate Oreo candy sundaes. Crazy S’mores milkshakes with chocolate, graham cracker and toasted marshmallow. Make this recipe just in time for National S’mores Day. Sally Abé serves up a stunning salted caramel freak shake recipe, featuring a rich salted caramel and peanut butter milkshake topped with caramelized peanuts, popcorn, and peanut butter cups.